Surrounded by mountains and breath-taking landscapes, the picturesque and vibrant Victorian town of Pitlochry is a hub of activity and boasts outstanding amenities. Known as the ‘Gateway to the Highlands’, it is the town’s close proximity to Scotland’s largest cities that makes it not only an ideal place to live, but also a magnificent and bustling destination. The historical town centre offers a lively atmosphere with rows of cafés, restaurants, eateries, pubs, hotels, High Street stores and outstanding specialist shops – all nestled in attractive, Victorian buildings with Baronial-style turrets. Everyday amenities such as banks, a Post Office, supermarkets, a small hospital, a doctor’s surgery, dentist, schools and a petrol station, ensure that this town caters for all your needs. Pitlochry boasts a rich cultural heritage and a jam-packed arts and culture calendar. Rated as one of the best theatres in Scotland, Pitlochry Festival Theatre hosts plays, musicals, concerts and events throughout the year – with the summer offering up to 6 productions per day! The Festival Gallery showcases fine art exhibitions and various art and painting workshops. During the winter the town hosts the Winter Words Festival, attracting over 40 authors, and during October over 20 000 people visit the spectacular light and sound show, The Enchanted Forrest, at nearby Faskally Woods. For any nature and sports enthusiast, Pitlochry is an outstanding setting with arguably the best walking and climbing trails in Scotland, taking you through breathtaking highland scenery, folklore and castle trails. Adrenaline seekers will be attracted by its wide selection of extreme sports including bungee jumping, white river rafting, canoeing and quad biking. In addition, Pitlochry is known as a superb spot for the more relaxing outdoor experiences of angling, golfing and boating. A tranquil stroll could see you pass the River Tummel, the Rob Roy Way, the well-known fish ladder and dam (full of salmon), rare bird and animal species at Loch Faskally, Tay Forest Park nature reserve, the town’s two whisky distilleries and ancient settlements and Pictish carvings. 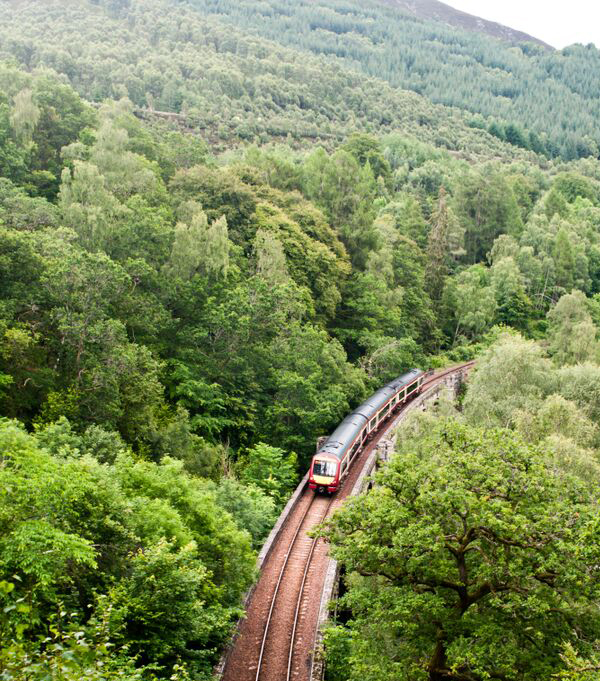 The attractive Victorian train station in Pitlochry offers regular and fast train services to all the major cities in Scotland and a sleeper train to London – but with all this on your doorstep, why go anywhere else?